Some companies capitalize on current health learnings and trends, like Omega-3s and probiotics. They use this to increase their sales. For example: A new milk sold by Horizon Organic, advertises in big letters “DHA Omega-3.” A higher Omega-3 content can actually be achieved through pasture-raising cows, and providing them with a better, healthier diet. 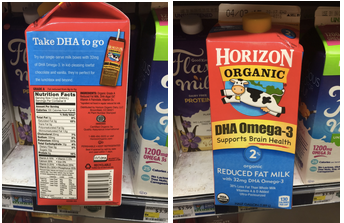 However, a flip of the milk carton reveals that Horizon Organic has done none of this, but rather has added algae oil (rich in Omega-3s) to their milk, in an artificial attempt to increase the Omega-3 content. Trans Fat have been proven to cause heart disease and have slowly been removed from circulation. 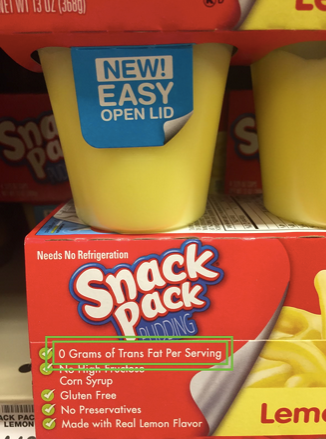 In US supermarkets however, if a product has less than 0.5g of trans fats per serving, the FDA allows the food label to read ‘0 grams trans fats per serving’. This measure is misleading. These hidden heart-disease-promoting trans fats can add up quickly, especially since most products containing them make sure the serving size is small enough for the ‘0 trans fats’ label to be allowed. How to spot them is simple: any mention of ‘hydrogenated’ or ‘partially hydrogenated’ oil directly implies the presence of trans fats, and you should avoid that product, despite what the packaging says.